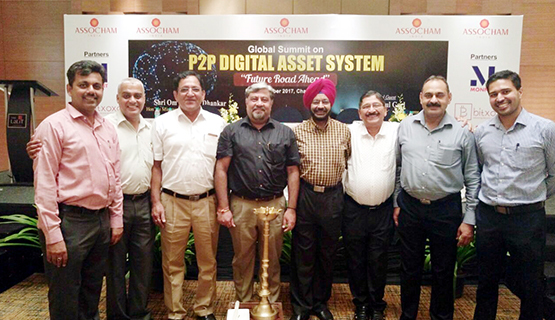 CMA participated in ASSOCHAM’s Global Summit on P2P DIGITAL ASSET SYSTEM-“FUTURE ROAD AHEAD” at Hotel Lalit, IT Park, Chandigarh on 5th September 2017. Shri Om Prakash Dhankar, Hon’ble Minister of State for Department of Development & Panchayats, Government of Haryana inaugurated the session by lighting the lamp of knowledge. Distinguished speakers from renowned organizations enlightened the audience on issues such as adoption of effective, efficient, and innovative Blockchain Technology in all possible classes and verticals of the organizations would go a long way in creating a conducive environment for its accelerated growth and development in India. The questions asked by Prof. J P S Nindra and Mr. Manjiv Kumar Vohra were appreciated and answered by the panel of speakers by giving various illustrations.